Location : Each of the four holy shrines of the Char Dham is located at a height above 3,000 m above sea level. The four temples in a geographical context form two distinct groups, that of Badrinath-Kedarnath and Gangotri-Yamunotri, with the common starting point at Rishikesh. Tourist Attractions : Chardham - Badrinathji, Kedarnathji, Gangotri, Yamunotri. Nearby Tourist Destinations : Haridwar, Rishikesh, Mussoorie. In the layers of the snow-covered reaches of the lofty Garhwal Himalayas in Uttarakhand are located the holy Hindu shrines of Badrinath, Kedarnath, Gangotri and Yamunotri, together form the Char Dham or the Four Holy Shrines. 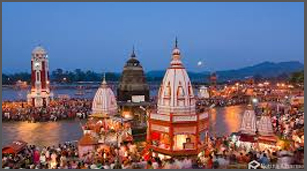 The region is referred as the land of the gods in the ancient Puranas. Scores of pilgrims visit the shrines by trekking arduously along the mountain paths, all for a communion with the divine. Over the centuries, these sites have been described in sacred Badrinathscriptures as the very places where devotees could earn the merits of all the pilgrimages put together. Subsequently, temples were built at these sanctified sites for all and sundry. Badrinath, dwelling at a height of 3,133 m, is said to be unparalleled in its sanctity when compared to other pilgrimages. Badrinath is located in the Narnarayan range against the imposing Neelkanth peak. The Badrinath temple is stationed in a beautiful valley on the bank of the River Alaknanda and is dedicated to Shri Badrinathji, that is Shiva the Creative Destructor. The temple traces its origin to Adi Shankaracharya in the 8th century, though legend has it that the temple stands on the site of an earlier shrine. The present temple was built about two centuries back by the Garhwal kings. The main idol in the temple is of black stone and represents Vishnu seated in a meditative pose. The temple is divided into three parts: the garbha griha or sanctum sanctorum; the darshan mandap where the prayers are held; and the sabha mandap where devotees assemble. Below the temple are the hot springs, Tapt Kund and Surya Kund, with waters at a temperature of 55�C. There are four other Badris or shrines dedicated to Lord Vishnu that can be visited from Badrinath. They are Yogadhyan Badri, Bhavishya Badri, Bridha Badri and Adi Badri. Forty-two kilometers from Badrinath is Joshimath, the winter home of Shri Badrinathji. East of Badrinath is the beautiful Valley of Flowers and the holy lake of Hemkund. According to the Guru Granth Sahib, the holy book of the Sikhs, Guru Govind Singh, the tenth Guru of the Sikhs, meditated on the banks of Hemkund. Kedarnath, at a height of 3,581 m, is the site of one of the 12 jyotirlingas in the country. The temple built of solid gray stone stands against the backdrop of Kedarnath range. According to legend, the Pandavas came here to pray to Lord Shiva after their victory in the great battle of Kurushetra to atone for killing their own kin in the course of the war. However, Lord Shiva kept eluding them and sought refuge at Kedarnath in the form of a bull. On being trailed, he plunged into the ground, leaving only the hump exposed on the earth, which is worshipped at the shrine. His arms are believed to have surfaced at Tungnath, his face at Rudranath, belly at Madmaheshwar, his locks and head at Kalpeshwar. These spots where he reappeared (together with Kedarnath) form the Panch Kedar. All these places are located in the Garhwal Himalayas and can be visited from Kedarnath by road and subsequent trekking. 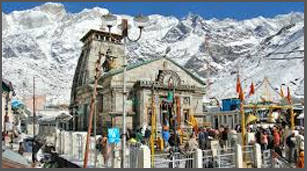 The present temple at Kedarnath traces its origins to the 8th century, having been resurrected by Adi Shankaracharya. It stands adjacent to the site of an ancient temple built by the Pandavas. The samadhi or final resting place of Shankaracharya is behind the temple. Eighteen kilometers downstream from Gaumukh is Gangotri. It is an important pilgrim site located at 3,048 m above sea level. The Gangotri glacier is the original source of the river. There is a temple dedicated to Goddess Ganga and the sacred stone where Raja Bhagirath is believed to have worshipped Lord Shiva. Submerged in the river here is the natural rock Shivling where Lord Shiva is believed to have received the Ganges (called Bhagirathi here) in his locks. It is visible in the winter months when the water level recedes. The shrine of Yamunotri, at a height of 3,235 m, is dedicated to the river Goddess Yamuna. The temple of Goddess Yamuna is the main pilgrim site and there are many thermal springs in the vicinity. Also present is a divya shila, a rock pillar that is worshipped before entering the Yamunotri temple. We offer best accommodation as per your requirements. Accommodation offered are complete with high quality facilities and services, so that your trip to Chardham is absolutely satisfying.